Former New York State Governor Eliot Spitzer- known for his tough stance and vigorous pursuit of white collar crime on Wall Street when he served as the state’s Attorney General- is facing two massive lawsuits after a column he posted last summer detailing alleged fraud on the part of major insurance brokers. Spitzer and Slate.com are named as defendants in the suits filed on August 19th at both the Federal and State levels. The plantiffs, William Gilman and Edward McNenney- formerly of Marsh & McLennan-allege defamation and are seeking damages of $30 million in the state-level suit and $90 million in the Federal suit. 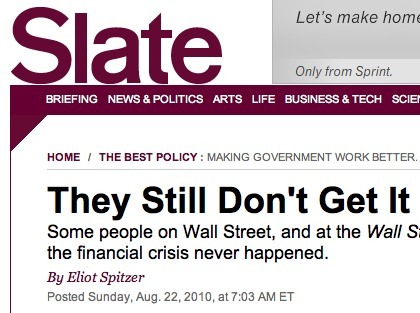 The suits were filed on August 19th, almost exactly a year after Slate.com ran the column in which Spitzer excoriated the firms and executives for what he described as “a range of financial and business crimes.” Spitzer repeatedly attacks the Wall Street Journal in his piece, contending that while the defendant’s convictions were overturned, a WSJ editorial about the case “[failed] to note the many employees of Marsh who have been convicted and sentenced to jail terms, or that Marsh’s behavior was a blatant abuse of law and market power: price-fixing, bid-rigging, and kickbacks all designed to harm their customers and the market while Marsh and its employees pocketed the increased fees and kickbacks.” Spitzer mentions that Marsh & McLennan paid a fine of $850 million to settle the claim and replaced leadership within the firm following the trials. Slate has not commented on the suits.